I didn’t do much Greek while I was at Bible College but I do remember certain words. ‘Koinonia’ is one of them, found in Acts 2:42, as well as in other places. When used in context, Koinonia can often be translated as communion or fellowship, however, another translation of the word is joint participation, or a more commonly used term, partnership. Since joining All We Can’s fundraising team as a Churches and Volunteers Officer, I have heard and used the word partnership regularly. I’d be rich if I got a pound every time I said it! 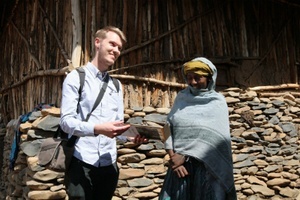 Recently, my understanding of the word partnership has been transformed during my eight-day trip to Ethiopia. The purpose of the trip was to get alongside our local partner organisations, exchange knowledge and have a chance to visit some of the work they do in rural farming communities. It was fantastic to see the strong bonds formed between All We Can and our local partners! It was after a meeting with a local partner, an organisation called Alem Birhan, that I realised the relationship formed between All We Can and Alem Birhan was mirroring an image of the early church, from Acts 2:42 -47. “They devoted themselves to the apostles’ teaching and to fellowship, to the breaking of bread and to prayer. Everyone was filled with awe at the many wonders and signs performed by the apostles. All the believers were together and had everything in common. They sold property and possessions to give to anyone who had need. Every day they continued to meet together in the temple courts. They broke bread in their homes and ate together with glad and sincere hearts, praising God and enjoying the favour of all the people. And the Lord added to their number daily those who were being saved.” Acts 2:42-47 NIV. All We Can’s Ethiopia Partnership Manager and I sat with the leaders of Alem Birhan, from Ethiopia. Despite the potential language and cultural barriers, we were able to encourage one another in faith and fellowship. In the rural communities, I was filled with awe and wonder. I visited families that were incredibility hospitable despite the food insecurity that they faced. They were so joyful at the prospect of receiving seeds and training to ensure better harvests. Alem Birhan’s partnership with All We Can enables this training to be delivered. All We Can’s support to local partners is only made possible through generous donations from our supporters who act in love and give to anyone who is in need. We praised and thanked God together and in that, I saw partnership for what it truly was. A united passion and commitment to do our best so that the lives of individuals, families and communities can be transformed. So that every person’s potential can be fulfilled. I believe this is what the early church strived to do. All We Can have trusted overseas partners to deliver our emergency and long term development work. We are also fortunate to have our dedicated supporters that we consider to be invaluable partners in fundraising, solidarity and prayer. Whether it be regular givers who pledge monthly to give to our work or All We Can Partner Schools and Partner Churches who commit their time to pray and fundraise. We commit whole-heartily to these relationships. When done right, partnerships are like that beautiful picture in Acts of the early church. I had the privilege of seeing this picture through our work in Ethiopia. I also have the privilege of witnessing it in my role as Churches and Volunteers Officer, helping relationships grow stronger between churches and All We Can. I invite you to consider partnering with All We Can, whether it be as a regular giver, as a church or as a school. You can see how your life and the lives of others around the world can be transformed when you walk together in partnership with All We Can. Matthew Forsyth is All We Can's Churches and Volunteers Officer for London and the South East.